Nokia 3310 first look: Legend reborn, but do you want a dumb phone in 2017? If you're over a certain age, chances are you owned a Nokia 3310, or, at the very least, knew someone who owned one. It's the Kevin Bacon of mobile phones. Why was the 3310 so popular? It was damn near indestructible, the battery lasted for weeks, the ringtone was stuck in everyone's head, at all times, you could personalise it with swappable shells purchased from a market stall, and it played Snake. The first thing you notice is how much smaller the 2017 model is. Components have shrunk, but HMD claims you'll still get up to a month's standby battery life and 22 hours talk time. It also feels like it could take a few knocks, perhaps not as many as the original, but we'd guess it's more durable than the glass/aluminium smartphone in your pocket. The Nokia 3310 is still very much a feature phone, there's no Wi-Fi or app store, instant messaging or virtual assistant. The phone has been modernised, however. There's now a 2MP camera, 2.4-inch colour display (not touchscreen), and a refreshed design (although, still available in original colours). Snake has received a face lift as well, you still control the hungry serpent using 2, 4, 6 and 8 on the key pad, but now it's colour (and I'm still terrible at it). There's also 2.5G for (slowly) browsing the internet, Bluetooth, a music player, and a 3.5mm headphone jack (take that Apple). It charges using a standard microUSB cable. Who is this phone for, then? We're certainly not going to be ditching our smartphones for it anytime soon. 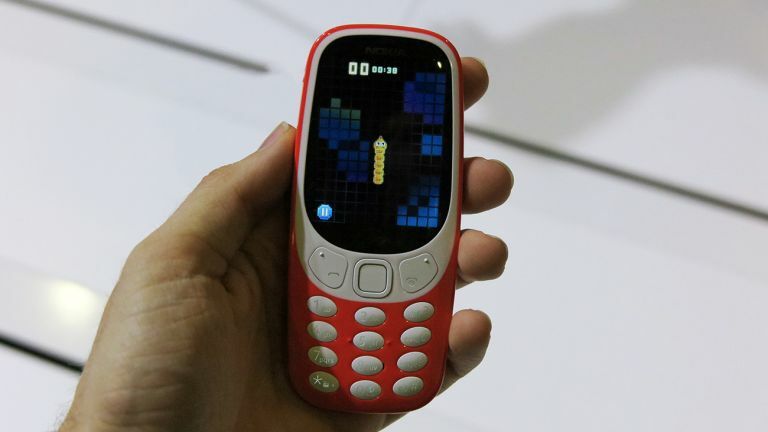 The updated Nokia 3310 will appeal to the Luddites amongst us that don't like smartphones, and at only £50 it's also the perfect 'second' phone, which you can take to gigs and festivals without worrying about charge or it getting damaged/lost. Are Nokia onto a winner here? We have no idea if they'll sell many in the UK, but the revived 3310 has certainly generated a lot of hype around the brand's re-entry into the phone market, so we think it's already succeeded.